Welcome to adventure! You are about to enter the world of Powers and Perils, a completely new fantasy role-playing system, that breaks from the old standards to create an environment of unlimited, exciting adventure. As you read the four books that comprise the basic rules, you will discover that the rules are presented, as much as possible, in the order that they are used. Throughout the first two books, where it is appropriate, you will find optional rules to enhance or simplify various rule sections. These are provided to allow you to select the level of difficulty that is most appropriate to the world that you choose to run. We present basic rules backed with a wealth of data and systems geared to unlimited variation. You choose, from this hoard of information, the rules that fit the abilities, experience and biases of your world and its participants. Within this package, you will find four books, a pad of detailed Character record sheets and three dice. The first book details the basic rules that are required to create a Character. 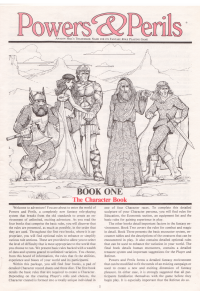 Depending on the creating Player"s rolls and choices, the Character created is formed into a totally unique individual in one of four Character races. To complete this detailed sculpture of your Character persona, you will find rules for Education, the Economic section, an equipment list and the basic rules for gaining experience in play. The other books detail important factors in the fantasy environment. Book Two covers the rules for combat and magic in detail. Book Three presents the basic encounter system, encounter tables and the descriptions of the creatures that can be encountered in play. It also contains detailed optional rules that can be used to enhance the variation in your world. The final book details human encounters, contains a detailed treasure system and important suggestions for the Player and Referee. Powers and Perils forms a detailed fantasy environment that can be modified to fit the needs of an existing campaign or used to create a new and exciting dimension of fantasy pleasure. In either case, it is strongly suggested that all participants familiarize themselves with the game before they begin play. It is especially important that the Referee do so. Scans of the original books. HTML version of the original books. Combined book containing Book I and Book II, at version 1.2, with a front and back page made from the original box art.